Christmas is in the air and I know I’m not the only one thinking about what to give all the people that I love. We just moved to the tiny town that my husband grew up in. Tiny town life means two things 1) we know and are friends with nearly everyone or 2) we are related to everyone else. My list for friends and neighbor gifts is huge this year so I’ve been pondering on the perfect thing to give that won’t break the bank. That’s where this adorable hot cocoa gift set comes in. 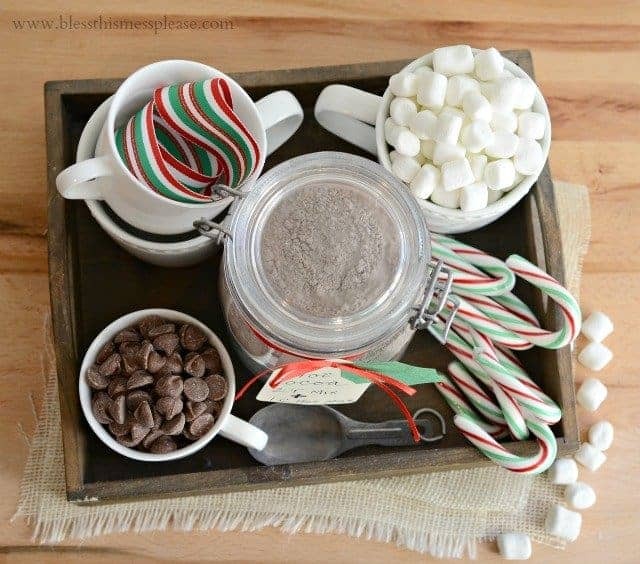 All of the jars, cups, and tray come from the thrift store (though you’d never know it…) and the hot cocoa is a homemade mix from some super simple ingredients. Throw this in a big cellophane bag with a pretty bow on top and you have yourself a gorgeous present for under $10. Now that is something to celebrate. I love giving gifts that don’t have to be used right away too. If they recipient is a little sugared-out, saving this gift until after the New Year is no problem. This would also be the perfect gift to give to your favorite babysitter, teacher, or bus driver too. Everyone likes hot cocoa! 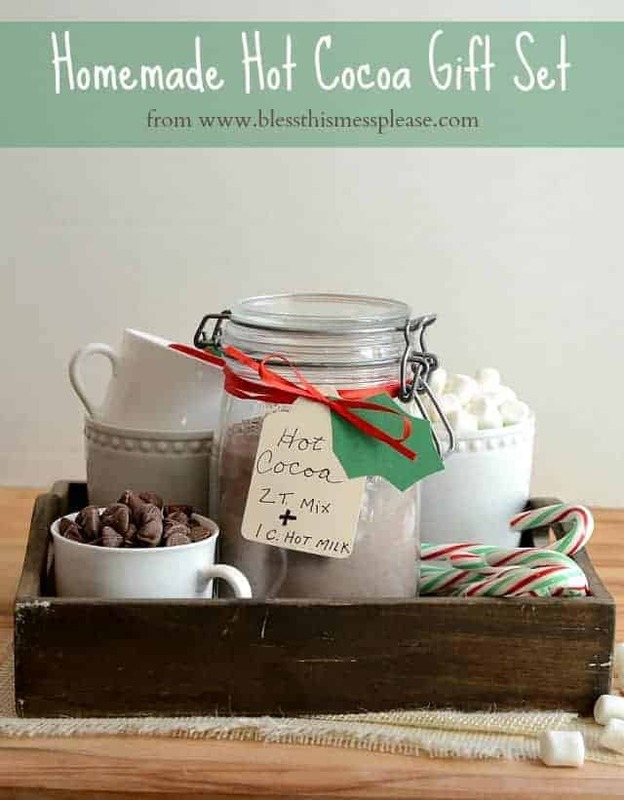 Enjoy this simple gift, a super easy hot cocoa mix recipe, and all these wonderful holidays! Add all the ingredients to a large bowl and stir with a wire whisk to combine. Store in a large air tight container indefinitely in the pantry. When ready to use fill mug 1/3 to 1/2 full with powder then add hot milk or water. About 2 Tablespoons of mix is needed per cup of hot milk or water. To make the gift you will need something to store the hot cocoa in (mason jar?! ), mugs, marshmallows, chocolate chips, and candy canes. A little tray to store it all in is a really nice touch. I bought the jar, 4 white mugs, and the tray at the thrift store for $3.75 for everything! Shop around. If you can’t find all the extras a pretty jar with cocoa and a decorative spoon will make a great gift to. Use what you have! Enjoy and Merry Christmas to you! And since I can’t give you this in person I’m hosting a giveaway this Christmas! Don’t forget to enter my favorites things giveaway and I’ll mail you some treasure! I really like how you let the tray and mugs keep their “personality”, and you didn’t change them at all. The recipient will be able to use them all year long, like for having herbal tea and cookies during a spring rain. Very very nice gift idea!